Hello everyone, and welcome to my second blog of the summer. I have some exciting news to share with you! A special pilot project that we have been working on in the museum is finally ready to launch. Get ready to zoom in and out and travel upside down through our guided tour of the history of Sir Frederick G. Banting Square. Using the interactive website Prezi we have created an online presentation to share with you the history and beauty of our gardens. Did you like it? Did you learn something? Please let us know! Comment below, or in the Prezi window, to let us know what you think! If all goes well we hope to launch more Prezi presentations in the future to showcase our exhibits and artifacts. This past week the museum has been buzzing with excitement about our upcoming event, ‘Our Man on the Moon.’ A contest was launched today – everyone who ‘shares’ our post on their Facebook timeline will automatically be entered to win a Banting House NHSC prize. Don’t forget to enter before it’s too late! You can find the post here on our Facebook timeline: https://www.facebook.com/BantingHouseNHS Good luck! You can find more information on ‘Our Man on the Moon’ on our Facebook event page here: https://www.facebook.com/events/244702185673602/ We hope to see you on Monday, July 15th at 6:30pm. 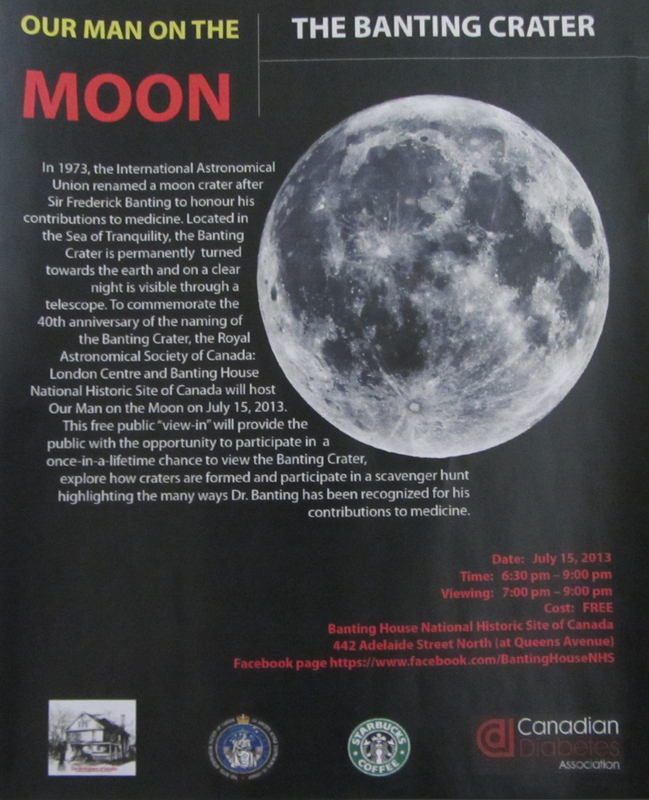 All of us here at Banting House NHSC are looking forward to seeing you this Monday, July 15th for the 40th anniversary of the naming of Banting Crater! Until then, please stop by to explore Dr. Banting’s former home, or enjoy our online tour of Sir Frederick G. Banting Square! Posted in Museum Happenings and Events.Tagged Diabetes, Flame of Hope, Global Garden, Queen Mother, Sir Frederick G. Banting Square.